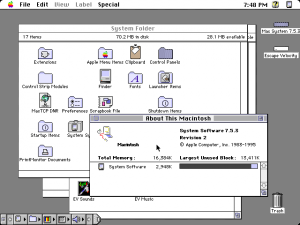 Replaced System 7.1 as the next major version of the Apple Computer system software. Macs that can run System 7.5 without an Enabler. SE(FDHD), SE/30, Classic, Classic II, Color Classic, Color Classic II. II(FDHD), IIx, IIcx, IIci, IIfx, IIsi, IIvi, IIvx. LC, LC II, LC III, LCIII+, LC 475, LC 520, LC 550, LC 575, LC 580, LC 630. Quadra 605, 610, 630, 650, 660AV, 700, 800, 840AV, 900, 950. Performa 200, 250, 275, 400-430, 450, 460, 475/476, 520, 550/560, 575, 580/588, 600, 630-638, 640DOS. Portable, PowerBook 100, 140, 145, 145B, 170, 160, 165c, 180, 180c, 520, 520c, 540, 540c. PowerBook Duo 210, 230, 250, 270c, 280, 280c. Workgroup Server 60, 80, 6150/60, 8150/80. versions 7.5 or 7.5.3. The functionality is reduced to that of System 7.1 + Update 3.0.
to download 7.1. The memory requirements are shown below for a Mac SE/30 20/100. and choose Custom Install. and choose Custom Install.